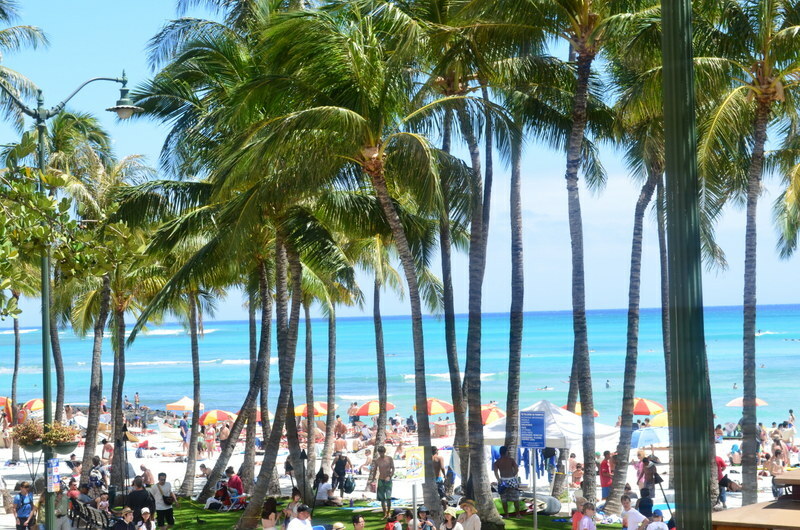 Monday, August 20, 2012 – Sorry for the delay in sharing my astonishing dreams about Hawaii. I’ve been just a bit busy lately with several assignments to do, rehearsals for a show at the Charleston Elks Lodge, more assignments – unexpected, but so welcome, and of course, getting all the photographs I took of Hawaii printed. I had over 503++ photographs to print and I must say, my new camera certainly performed well. When Phil looked at some of the photographs, he actually complimented my photography skills. How nice! A few weeks ago I was selected as a ‘qualifier’ for the Lowcountry Karaoke Idol Contest in Charleston. For this part of the competition I sang, “At Last.” The club finals for Manhattan’s Bar & Grill were Friday, August 17, 2012. I’ve practiced my song [“I Who Have Nothing”] to make certain I knew it and could hit the notes. Piece of cake! Tom Jones is one of my favorites and I sing his songs all the time! At the competition, I was as calm as a cucumber, but I did check out the competition! Four guys, three girls will compete, and I knew one of them! I was a bit concerned because she and I are great friends and I will do nothing to jeopardize our friendship! After all, great friends (especially women!) are so hard to find. The clock was ticking…10pm and the competition begins! I listened and watched the singers, paying attention to see if they were getting into the performance. Many of them looked at the monitor – silly, don’t you know you are SUPPOSED to lose points IF you look at the monitor! Several singers were not too bad! Finally, my name was called. I grabbed the microphone, and turned away from the monitor! I confess, when I’m singing, it is a performance and I am totally focused on what I am doing. I did not notice if I had the attention of the crowd or not. I just belted out my tune, moving and grooving with the audience. Much to my surprise, I was selected for second place. The score was 66-64 and if the first place finalist is unable to represent Manhattan’s for the City Finals, then I will perform. C’est la vie! Story of my life! I suppose second place isn’t too bad – after all, it’s karaoke – except I love performing!!! An additional surprise occurred while jet lag was refusing to leave me. Early one morning, I checked e-mail, receiving an invitation to attend a press trip to Aruba. I read the itinerary and invitation well, letting it rest on my desk while I debated about it. The press trip was less than two weeks away. Not enough time for me to query publications about story ideas. Since I’ve never been to Aruba, I declined the invitation, requesting a rain check. My rule is to at least have query letters out to publications before attending a trip. Gosh, how I wanted to go! 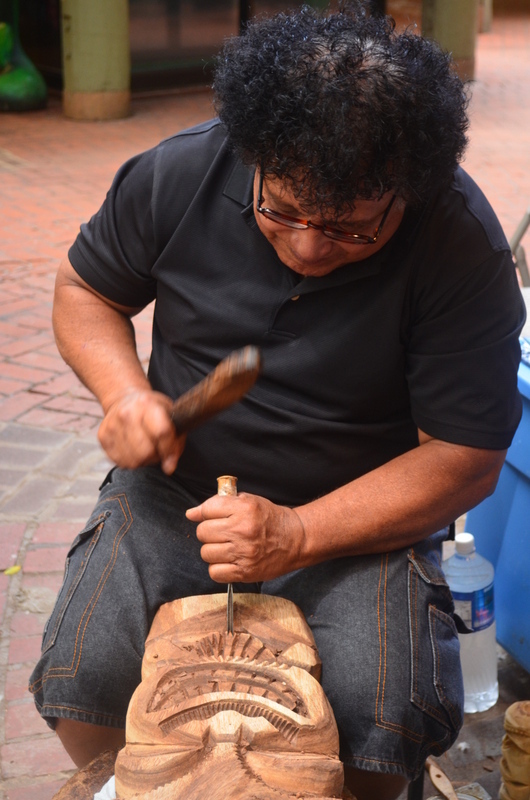 Today, our discussions will include additional events on Phil’s birthday – July 8, 2012 — evening events, walking to International Market Place, along with the characters we met, the street performers, and other interesting characters. 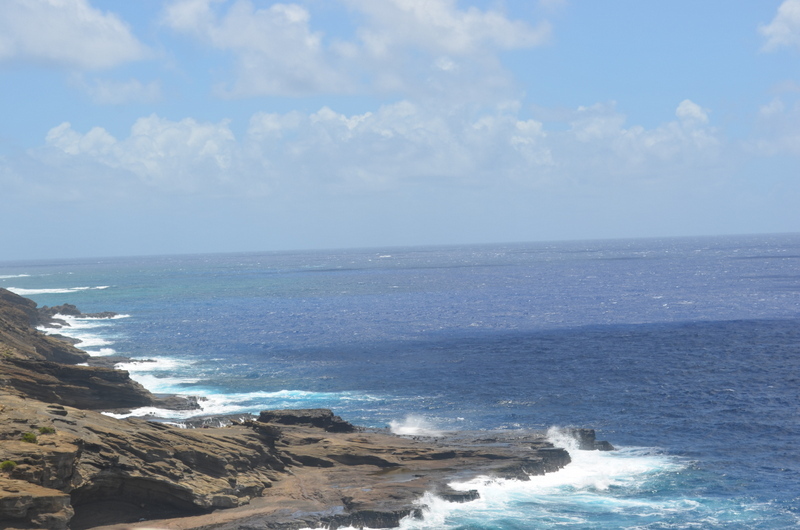 We had a nice day traveling around Honolulu, admiring the breathtaking beauty and views, the coastal highway, searching for whales, which we never found, and the amazement of Blow Hole. How I wanted to sneak a rock, shell, or something unique that I could stash in my suitcase, but I was fearful that I would get caught, so when I found something, I simply let it slip through my hands. No lava rocks to take home. No sea shells. Nothing from within the lava foundations, the sea, or within the depth of the ocean. After all, I remember that silly form I signed before departing the American Airlines plane to enter beautiful Hawaii. I suppose I am just a bit too honest for my own good. If someone asked me if I am carrying something I shouldn’t, my eyes would give me away. I suppose I will never be a good liar! Besides, according to some of the legends of Hawaii, if you remove a lava rock, you are destined for bad luck – and I’ve had more than my share of bad life in my lifetime! Lava rocks and the mountains are truly amazing to look at while riding along the coast. To the left, your eyes admire the unique shape of the mountains. To the right, your eyes stare at the glittering iridescent blue ocean, the white caps slapping gently on the beaches and coastline. While I’ve always had an incredible passion for oceans, nothing compares or equals the turquoise waters I admire as we travel along the coast. I pinch myself. Please God, if I’m dreaming, never let this dream end. A few hours later we head back to the hotel. 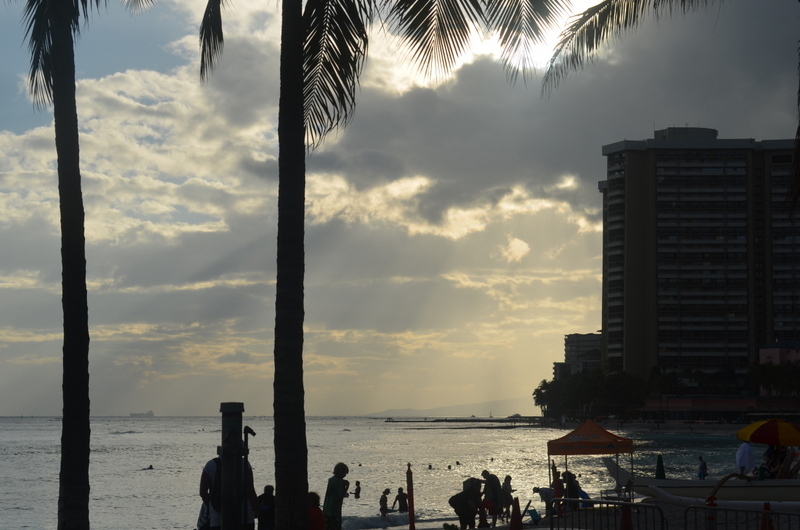 We are tired now, ready to relax and walk along Kalakaua Avenue. http://www.youtube.com/watch?v=VyyHaVPWj0k The sun is setting now as we walk. I am amazed at the wide sidewalks on Waikiki Beach. There are hundreds of people walking, but no one bumps into Phil or me and no one has a cell phone glued to their ears. In Charleston, people appear not to be able to walk unless a cell phone dangles from their ears, and they shout their supposedly private conversations into their phones, so the entire world can hear the latest one-sided gossip. Who cares! International Market Place is only a three block walk from our hotel. Dressed in shorts and a Hawaiian print shirt, with my Shape-Ups on my feet, I am ready for the business of shopping. I admit it. I hate shopping. Rarely do I find anything I want and I am a bargain hunter. Working in retail establishments for many years, I know how much items are marked up for profit, so I tell myself to look for bargains, or appear not to love an item too much. I want to barter! While walking I notice the designer shops. Many of them I’ve never heard of. I live on a budget so these shops look wonderful and oh so tempting, but I would probably be flabbergasted by the price tags. I choose not to go inside. We approach the entrance of International Market Place. Merchants are everywhere. Pleasant to the shoppers, the culture of Hawaii has taught the merchants how to charm and approach them. They nod their heads to everyone, speaking to a few, probably in hopes of making a big sale. I stop at several jewelry booths. OK, I admit it…I am a jewelry fanatic! I admire the coral, shells, the beautiful lei’s. All the jewelry is so beautiful. I honestly do not know where to start! International Market Place has changed dramatically since I visited it during our R&R. There are many specialty shops now. 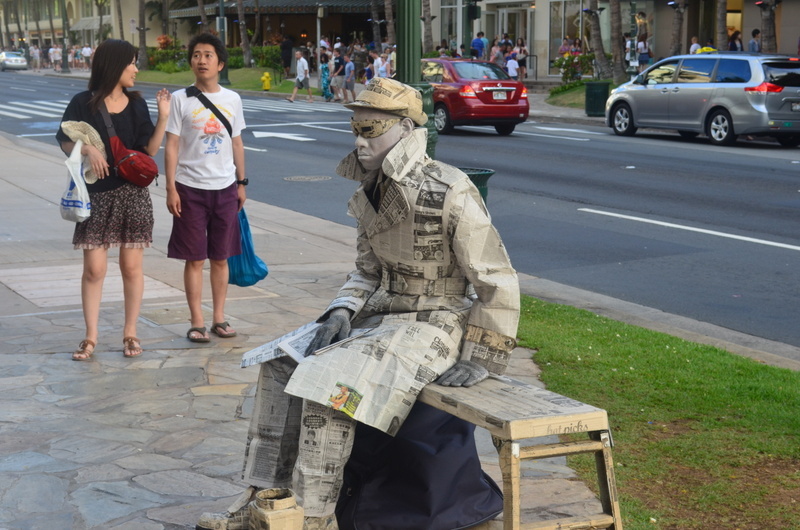 No matter what you are looking for in Hawaii, you will find it along Kalakaua Avenue. One thing to remember is to ask for a better price at the Market Place. Almost every merchant I approached was willing to negotiate with me. There was one shop where the shopkeeper said, “If you don’t like that price on the sticker, you will not find a better price around Kalakaua Avenue.” I left her shop without purchasing anything. I can truly say, International Market Place is one of my favorite places to shop, because I can negotiate. After all, my trip to Hawaii was planned in less than twenty-four hours and I had no time to get to the bank for additional funds. Thank goodness. I could’ve spent a small fortune. Headed back to Hyatt Regency Waikiki, the street vendors and entertainers are out. 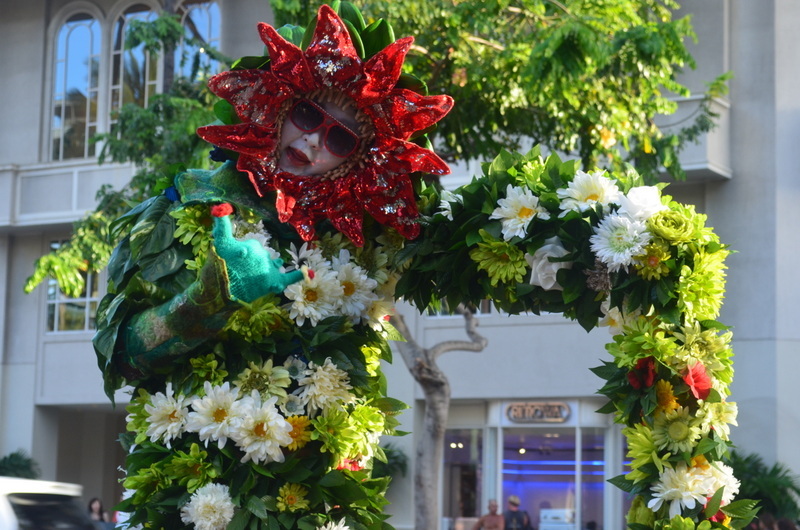 I snap a few shots of an Elvis wanna be, a man dressed in newspaper, another guy dressed in gold lame, and an interesting floral archway where a woman was inside with only her beautiful face exposed. By now the streets are filled with pedestrians. Much to my surprise, everyone moves without pushing or shoving, and everyone uses crosswalks. While we walked across the street onto an area filled with additional hotels, we stop at a park, pet a dog and decide we will cross the street in the middle of the roadway. A police officer sees us standing along the middle of the sidewalk. I reach for Phil’s hand as cars rush by. I have a phobia of crossing busy streets, reminding Phil he must hold my hand tightly if we cross here. [I was hit by a drunk driver when I was nine-years-old, suffering a severe concussion.] I’ve never been able to cross busy streets without shaking since then. We thank the police officer and move towards the traffic light. After we cross, the police officer nods to us. No doubt he was ready and waiting to give us a jaywalking ticket, but we followed his advice. After all, I really did not want to spend a night in the jail! Can you imagine – Phil and I arrested for jaywalking and spending the night in a jail? How dreadful! After we get back to the hotel, we hop in the car headed to Ala Moana Shopping Center. Years ago, we spent lots of money at Ala Moana Shopping Center. We were so young and carefree and our time in Hawaii was ticking away quickly. In two days, he would catch a flight back to Vietnam. When a lovely lady at the hotel we stayed at suggested shopping at Ala Moana, we spent a day there, looking at shops, admiring all the merchandise. Phil found a double-breasted jacket [yes, they were the style back then]. I took him inside, and we bought it. I didn’t care if he didn’t get to wear it very much. He wanted it. Money wasn’t an object. I wanted his memories of our first trip to Hawaii – our honeymoon – to be something to remember! Now, Ala Moana Shopping Center is filled with all sorts of specialty shops and restaurants. Many of these shops are designer shops. If you are looking for something unique and special, Ala Moana is the place to find it! http://www.alamoanacenter.com/Center-Information/Hours-Directions.aspx I found three pairs of shoes. Just how I would get them home was a concern, but I could not pass them up! Shoes are my weakness! Exhausted from a full day, we decided to dine at Blazin Steaks http://www.blazinwaikiki.com/ After dinner, we rush back to our room to watch a movie. My time in Hawaii is slowly ticking away and I am so sad to see it ending. Please, if I am dreaming, Never let me awaken from this dream! What is The Deal With the Do Not Call List?? ?